The top four players in the global controlled release fertilizers market viz Shandong Shikefeng Chemical Industry Co. Ltd., Chisso Corporation, Kingenta Ecological Engineering Group Co., Ltd., and Agrium, accounted for 49.1% of the market in 2015. Players in the market are directing their efforts to develop products that are user-friendly, states a new report by Transparency Market Research (TMR). In order to remain in leading positions, players are making use of newer technologies, thus catering to the dynamic consumer demands. Moreover, the growing population across the globe is expected to compel manufacturers to increase their production capacities so as to meet the demand for fertilizers. Players can establish long term connections with suppliers for acquiring raw materials at fixed prices so as to avoid volatility in costs. One of the trends seen in the market is the shift in focus of players on emerging nations to take advantage of cheap labor, thus ensuring low cost production. According to the report published by TMR, the global opportunity in controlled release fertilizers market will rise from US$2.41 bn in 2015 to be worth US$3.92 bn by 2024, expanding at a CAGR of 5.6% between 2016 and 2024. On the basis of product, the market is expected to be led by polymer sulfur coated urea or sulfur coated urea, the demand for which, is expected to rise from1.4 mn tons in 2015 to 2.5 mn tons by 2024. The demand for sulfur coated urea is high on account of its eco-friendliness, resource-saving properties, and low labor requirements. In terms of application, the cereals and grains segment is expected to lead on account of motivation from various governments to boost production with optimal use of chemical fertilizers. 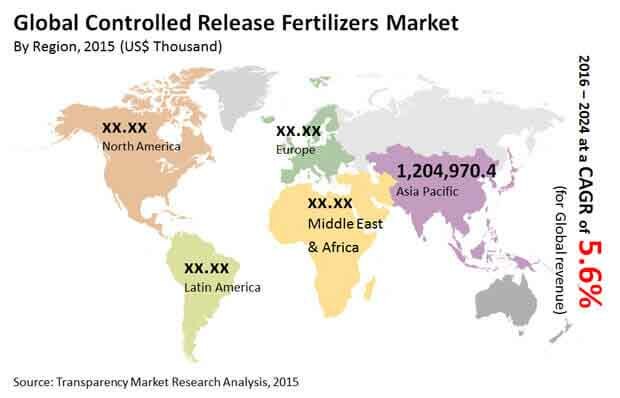 By geography, the Asia Pacific market for controlled release fertilizers is expected to continue to lead. China, followed by Japan has been the most active consumer of controlled release fertilizer in Asia Pacific. China and Japan collectively accounted for 92.4% of the demand from Asia Pacific. The growing population across the globe has led to the depletion of arable land and this in turn has caused lower yield. The high demand for food by the ever expanding population has resulted in a surge in the demand for controlled release fertilizers from many years. Controlled release fertilizers increase the crop yield and are thus, in demand. Also, these fertilizers are the need of the hour as the number of people quitting farming jobs and seeking other occupations is growing. The growing disposable income of people is creating a demand for food items such as high quality meat and organic foods and this is driving the need for controlled release fertilizers. Other factors driving the growth of the market include increasing initiatives by farmers to modernize farming techniques and a growing concern over food security, which is causing governments across countries to adopt controlled release fertilizers to boost production of crops and also to reduce import. Some of the challenging factors for the market include high prices and a lack of awareness among farmers, especially in emerging nations. The price of these fertilizers is higher than conventional fertilizers owing to the use of additives such as resins and polymer coatings.